Stanton (left), Publisher at the Worcester Business Journal. 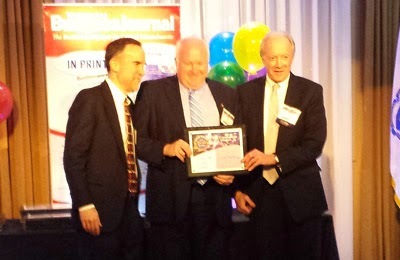 Curry Printing was honored by being named the regions “Best Commercial Printer” at the Worcester Business Journal’s 2014 Best of Business (BOB) Awards. The awards celebration was held on Wednesday, January 29th at Coral Seafood on Shrewsbury Street in Worcester. Attendees included over 300 professionals from businesses who were also selected for excellence in their individual industry or category. 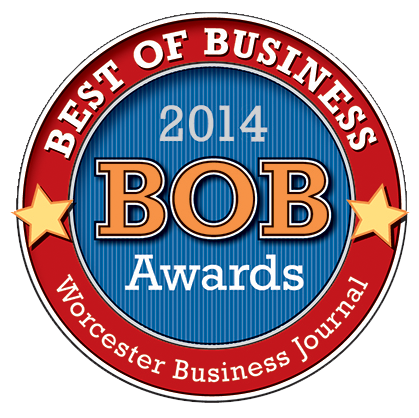 Awards were given based on an online readers’ poll conducted by the Worcester Business Journal (WBJ). This was WBJ’s first online survey. It was used to determine the best business-to-business companies that truly offer the best service, attention to detail and most customer-focused employees who deliver outstanding products and services. “Curry is thrilled to be selected for such a prestigious award,” says Peter Gardner, Curry’s President. “The fact that this distinction comes directly from voting done by our loyal clients and the public, this really means the world to us. Helping regional businesses excel is our focus and it’s great to see they feel we are doing our job well,” Gardner continued.